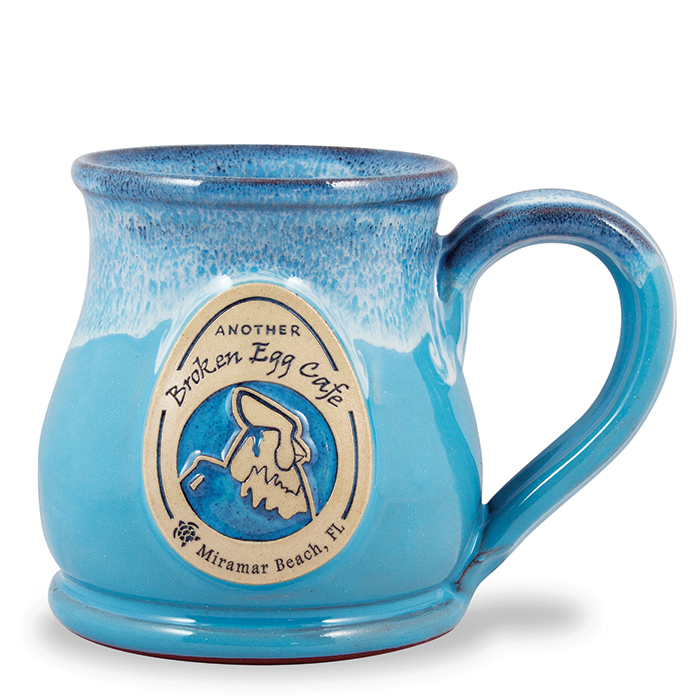 Our most popular Signature Mug™ style the Round Belly mug and the favorite of many of our restauranteurs - especially the Another Broken Egg franchise. Pictured here in our Powder Blue solid glaze, it features a nice wide base and tapered top that keeps beverages hot. Many of our customers have said that this is the perfect shape to cradle in your hands and we couldn't agree more. Fun fact - the Round Belly is the very first, and at one time the only, shape that we had in 1991 when we restarted with just one innkeeper - The Rosewood Inn located in Hastings, MN. Glaze: Powder Blue w/Blue White Industry: Food Service (We work with many different industries) Capacity: 10 oz. Favorite part of working at Deneen Pottery? Everything! Working alongside and inspiring our awesome staff and assisting our incredible customers. Getting to be around such a creative process and talented artists - the variety of 'opportunities' that fill my day keep me on my toes. Witnessing the transformation from proof to product.